There was a tragic shooting Saturday morning in Kansas City when Chiefs linebacker Jovan Belchar murdered Kasandra Perkins, the mother of his newborn daughter, before showing up at the practice facility and killing himself in front of his coach and general manager. This is about as bad a horror as one can imagine and the victims’ families deserve the outpouring of sorrow and grief from loyal football fans everywhere. 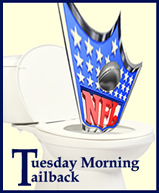 But that would not happen in the sports media. These cynical bastards could not wait to one-up each other in scoring political points with their left-wing bosses. This started slowly enough on ESPN’s Sunday morning coverage, which seemed to be totally sympathetic towards Belchar and the fact that he thanked his coach and general manager before shooting himself, before Tom Jackson chimed in and stated frankly that “Belchar is not a victim, he is a killer. Kasandra Perkins and the three month old little girl who is now an orphan are the victims here.” Yes! Some sanity in the conversation! But wait, Jackson then had to make a political point about gun violence. OK, a little inappropriate, but fair enough. After all, the gun was the weapon used here. Really Bob? Where do we start? First, not to get too gruesome here, but Belchar shot Perkins NINE times. Anyone willing to pull the trigger nine times would hack someone with a knife nine times or bash someone with a bat nine times. It is not as though there was an argument, the gun went off, and the victim tragically died of a single gunshot wound. Then there is this little inconvenient fact – one of the most infamous double-murders in American history was done with a KNIFE! 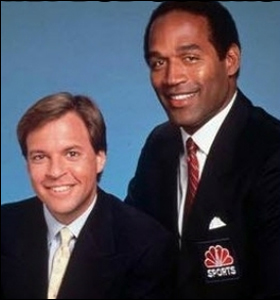 And this was perpetrated, of course, by Costas’s own long-time colleague at NBC Sports O.J. Simpson. Hey Bob, would Nicole Brown Simpson and Ronald Goldstein still be alive if O.J. didn’t have a gun? NO! The sad truth is that Costas’s commentary was not so much about the tragedy as it was about “hey look at me standing up for gun control”. Costas used the tragic murder of a 22-year-old new mother to score points with certain people in his media clique and but himself up for a potential award in “bravery” or something to stroke his own ego.